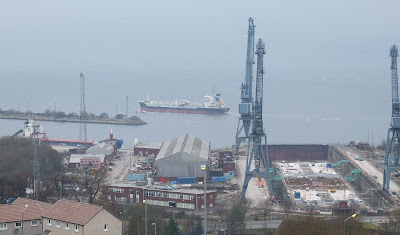 As the tanker ARTISTRY passes the entrance to the Great Harbour, construction of a floating jetty for the Royal Navy's submarine base at Faslane continues in the former Firth of Clyde Drydock at Inchgreen. The jetty, which is being built by AMEC plc will form part of updated facilities required for the new 'Astute' class boats, currently being built by BAE Systems at Barrow, and due to enter service from 2009. On the left of the picture the coaster RIVER BLYTH is lying at the Scott Lithgow Repair Quay, where she berthed yesterday morning for repairs. She is one of three sisters operating on charter to Stephenson Clarke Shipping, one of which, RIVER TYNE, visited the upper firth earlier this year.